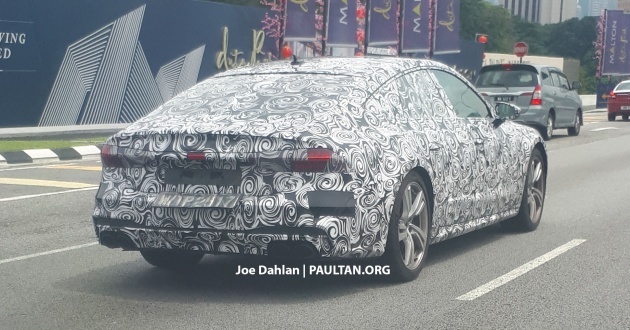 The second-generation Audi A7 Sportback has been spotted in Malaysia by paultan.org readers Joe Dahlan and Amirul. The model first made its global debut in October last year with a heavily revised design, as well as a suite of new technologies. On both occasions the car was spotted, including once along Jalan Kuching, there’s no shortage of camouflage applied to it. However, we still see many of the new A7’s cues, including its distinct window frame, rakish roof and significantly slimmer taillights compared to its predecessor. The rear lighting setup is comprised of 13 separate LED bars with varying sets of animations, so you’ll be guaranteed of a light show each time you unlock the car. Meanwhile at the front, there’s a new face featuring a wider and lower singleframe grille and sleeker headlights – the latter available in three versions: LED, Matrix LED and Matrix LED with laser light. One aspect of the car’s exterior that attracts our curiosity is the quad tailpipe setup, which differs heavily from the tucked away ones on a standard A7. This is a trademark of Audi’s S models, and we could very well be looking at the new S7 before its global debut! Moving inside, the entire dashboard has been overhauled to accommodate among other things, two touchscreen displays. Sharing quite a lot in common with the new A8, there’s a 10.1-inch upper unit and 8.6-inch lower display, while directly in the driver’s view is a 12.3-inch Audi virtual cockpit display. At its debut, the A7 is available with a 3.0 litre twin-turbo V6, badged as the A7 55 TFSI following Audi’s new nomenclature structure. The mill makes 340 hp and 500 Nm of torque, and is mated to a seven-speed S tronic dual-clutch transmission, good for a century sprint time of 5.3 seconds and 250 km/h top speed. All engines used in the new grand tourer will be electrified with Audi’s new mild hybrid system (MHEV). The system is made up of two core components – a water-cooled belt alternator starter (BAS) on the front side of the engine and a lithium-ion battery with 10 Ah charge capacity. It allows for coasting up to 40 seconds with the engine off completely, at speeds between 55 and 160 km/h. The BAS kicks into action once the driver accelerates again, restarting the engine quickly. Along with brake recuperation, Audi claims a reduction in fuel consumption by as much as 0.7 litres per 100 km. Like the A8, the A7 also comes with Audi AI, which provides Level 3 autonomous driving. This test mule could be used to test out the system, which is capable of driving the car itself on highways at speeds below 60 km/h in traffic. There’s also other functions such as remote parking pilot and remote garage pilot. Why does a CBU need to be in camo? Not like theres any tropical adaptation. The speculation is that this is a model that has yet to be launched, undergoing testing. 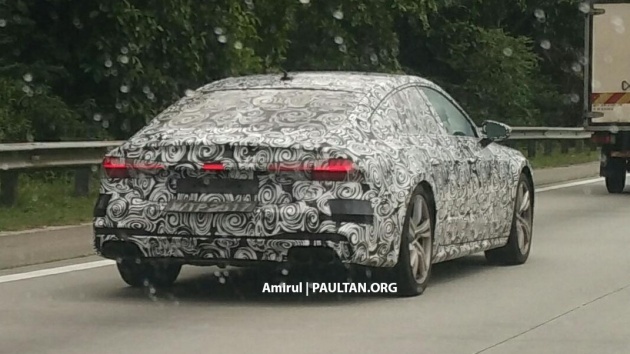 Could be an Audi Sport, a PHEV or even Audi testing the self driving capabilities in hot/rainy weather (aka Malaysia), where spray may affect visibility of the camera that reads road lines. Does that mean Audi now uses MY as their tropical proving ground? Like how others go to Sweden for winter testing? No, they are testing several aspects that malaysia is famous for. Like sudden flood. Or cut queue and cut in, to annoy the AEB. Or potholes. Too many of them that is hard to find in other parts of the world. One hell of a mean machine… one of my fav !! A glorified VW Arteon. Skip! audi is testing thier car on malaysia road? wow or meh? Nice….would love to own one but even going the recond route still proves to be exp.